As women, getting older means a massive hormonal change. But that doesn’t mean you can’t totally thrive as you age: Eating the right foods for menopause is one way to make it all slightly easier. Here’s a little background: As you get older, a few things start to happen at the same time. Your metabolism slows down, and your body needs more of certain nutrients. The challenge, then, is to get the body what it needs—like more protein and calcium—without overeating. Nutrient-dense foods like green vegetables, antioxidant-rich fruits, ancient grains, and lean protein are the answer. If you can load your diet with those, establish a regular exercise routine that includes plenty of strength training, minimize stress, and prioritize sleep, you can head off weight gain, which is one of the best ways to minimize menopause symptoms. Bad news: Hormonal changes can cause your bones to weaken, increasing the risk of osteoporosis later (and we know you want to be running and dancing ‘til the end!). To address that, you need to get more calcium and vitamin D. Dark, leafy greens like kale and spinach provide both—while delivering tons of other nutrients you need via very few calories. Eat ‘em at every meal. Tofu also provides calcium and is a great source of protein, which you need lots of to preserve and build muscle and prevent weight gain. (And tempeh is tofu’s fermented cousin, so you’ll get gut health benefits, too.) It also contains phytoestrogens, compounds that can mimic the effects of estrogen, potentially helping your body out at a time when it stops making as much estrogen of its own. One study found that soy supplementation among perimenopausal women was associated with a decrease in the perceived severity of vasomotor symptoms (hot flashes and night sweats) and cardiovascular disease risk factors like high blood pressure. That’s important because your risk of heart disease increases during menopause. If you’re worried about soy and breast cancer risk, read this update on the latest science. And don’t forget to opt for organic tofu and tempeh—in packaged foods, you’re almost always getting soy that comes from beans genetically modified to withstand heavy doses of chemical herbicides and that have been heavily processed into isolates. Speaking of heart disease, one of the best ways to lower your risk is to eat whole grains, like oats. Oats are an especially great choice because they contain lots of fiber, which helps with digestion. That matters because bloating can be worse during menopause, and you’ll want to keep things moving. Since this is a list of foods, we’re not going to focus on how much water you should be drinking, but, well…you need to drink a lot of water. Some unpleasant symptoms associated with menopause—like night sweats and hot flashes—contribute to dehydration. Others—like dry skin and vaginal dryness—are a result of it. Citrus fruits like oranges and grapefruits are super hydrating. They also contain fiber, plus tons of antioxidants to boost your overall well being. We already mentioned the decrease in estrogen in your body results in a decline in muscle mass and strength. That means you need more protein in your diet than ever before. Salmon is protein-rich while also delivering healthy fats that protect against heart disease. 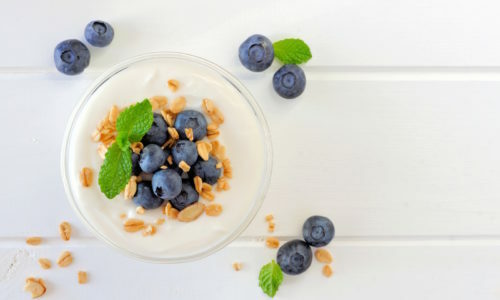 Okay, so far we mentioned the need to prevent bloating and the need for more protein, calcium, and vitamin D. Yogurt checks off all of these boxes with its probiotics and nutrient profile. Always go Greek for more protein and less sugar. Ground flaxseed is a great “add on” to your diet, since you can sprinkle it on almost anything, like salads and oatmeal, and blend it into smoothies. It provides fiber and healthy fats and like soy, is a source of phytoestrogens. More research needs to be done to determine whether those compounds can produce estrogenic effects strong enough to reduce menopause symptoms, but it can’t hurt to add them to your diet in the meantime.